This Fire Mistress costume consists of two pieces. The crushed velvet dress with flame detail and the PVC bolero jacket. A great Devil costume! Red metallic eyelashes. Includes a tube of eyelash glue.Great to add to your red devil costume. 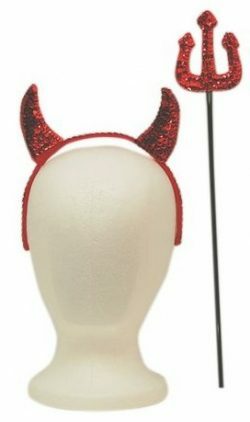 Sequin devil headband and fork set that is always handy to have for dress up occasions.